Cake is one confection that will never, ever go out of style. Witness shows like Duff Goldman's Ace of Cakes, Cake Boss, Amazing Wedding Cakes and now, Cupcake Wars, which not only engineer cakes, but make them, as Goldman says, "Bigger, badder, awesome!" Since its original release in 1977, nothing has been bigger, badder and more awesome in pop culture than Star Wars. From Wookiepedia to sold-out Star Wars conventions to Williams-Sonoma's Star Wars cookie and pancake molds, The Force is still going strong, especially in cake form. To prove it, turn the page for our Top 10 Star Wars cakes. 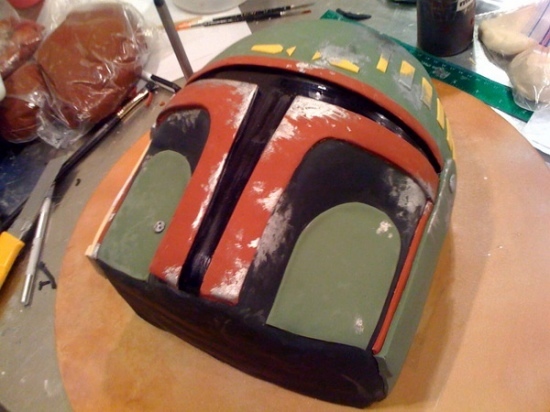 This cake is, one can only hope, a replica of Boba Fett and not his father, Jango Fett. Why? His father was decapitated by Mace Windu at the end of Episode II. Would make for a much messier dessert. Unlike Boba Fett inside the Sarlacc Pit, however, this cake probably won't take over one thousand years to digest. Chewbacca is pictured here in a pose reminiscent of the one he struck after beating R2-D2 in a game of Intergalactic chess. Look at the Wookie (also known as Princess Leia's "walking carpet"); he's so proud of himself. This near-perfect replica of R2-D2 practically made our heads spin, just like the little droid himself. However, since this version of R2 is immaculately clean, it presumably represents a time before he crash-landed in the swamps of the Dagobah System. He's just missing his medal of honor from helping blow up the Death Star. 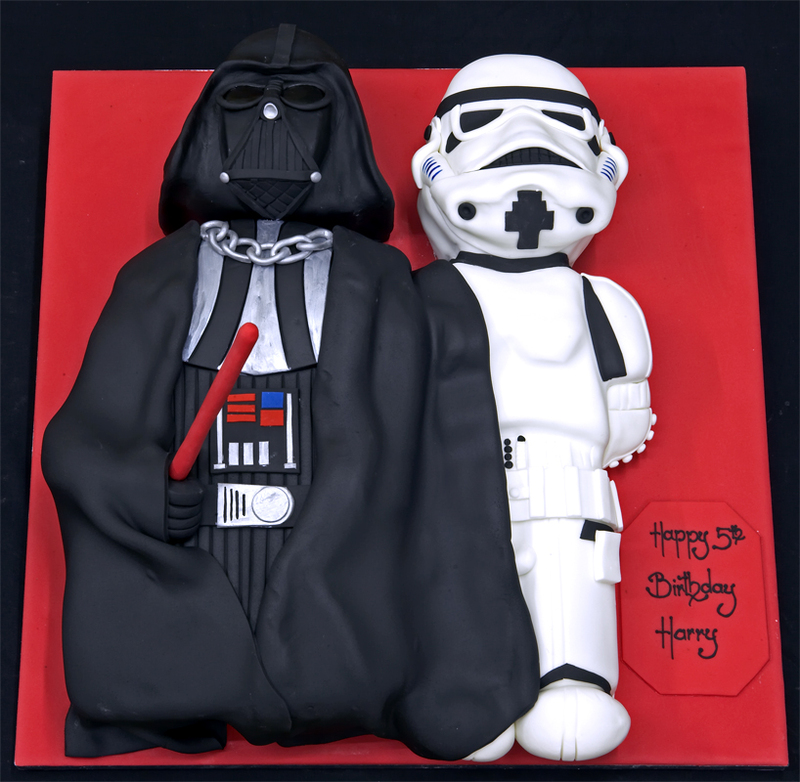 This cake version of Darth Vader and Storm Trooper is much more cartoonish in nature, unlike the real version who would torture you for information on the Death Star. Watching Han Solo become frozen in time inside a carbonite coffin terrified every pre-teen who saw the Empire Strikes Back. This incredibly realistic cake replica is not only mouth-watering, but a little terrifying. Nine hundred years old at the time of his death, Yoda is pictured here in his spry younger days when he served on the Jedi Council. As a Jedi Master, he could influence the thoughts of weaker-minded beings. We can just hear him telling us, "Eat this cake, you will." Jabba has clearly indulged too much between the first time we saw him in Episodes I and IV and his final appearance in Return of the Jedi. Instead of sitting around all day keeping Princess Leia on a leash, maybe he should have taken her out for the occasional run around the sand barge. Look closely at the crazy details on this cake and you'll realize they're not perfect. But they're not meant to be. After being won from Lando Calrissian by Han Solo during an Intergalactic poker tournament, the Millenium Falcon became Solo's smuggling vessel and endured many outer space beatings. 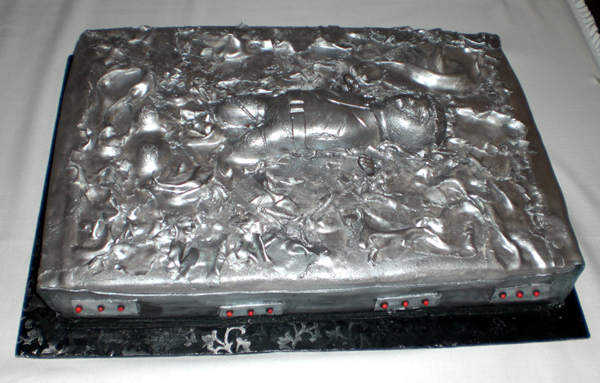 Ladies, if you're going to get your man a Star Wars Groom's cake, this is the one. It's capable of attaining 0.5 past light speed. But be careful, it might just blow up your cupcake tower. We sure hope this couple had a wonderful wedding, but if you want to get technical about their cake, Ewoks were in a completely different episode (and planet) than this model of AT-AT (All Terrain Armored Transport). The AT-AT pictured here, on the unforgiving ice planet of Hoth, had just been felled by Luke Skywalker's plane. That would explain its prone position, not to mention make it easier to cut into for the bride and groom. Okay, here's where we lose the casual Star Wars hobbyist and focus on the hard-core fan. As any über-fan can tell you, Han Solo saved Luke Skywalker's life when they were stranded overnight on the planet of Hoth. In order to survive the sub-zero temperatures, Solo cut open and slept in the belly of his own tauntaun (basically an intergalactic horse) which had just succumbed to the freezing temperatures itself. Hopefully this amazingly detailed wedding cake (yes, wedding cake) tasted way better than tauntauns smell.